“Then they set the house on fire and everyone inside was screaming – I was the only one who got out”. Maggie O’Kane’s 36-hour trek out of besieged Gorazde brought her to Visegrad with its burned houses along the Drina river valley, a small haven for eastern Bosnia’s Muslims driven from home by conquering Serbs. In the valley, the survivors told their story. Her ears are melted away. All that is left are two waxy, twisted beige blobs like burned out candles. Her forehead is covered in a huge scab that is still healing and her nose is a maze of burst blood vessels. She holds out her bandaged burnt arms delicately in front, like a Hindu woman at prayer. She says she is the only one who survived. Her name is Zehra Turjacanin. She is aged 31, a textile worker from Visegrad with a Muslim name. This is her story. “It happened on June 27. Milan Lukic, a policeman in Visegrad, knocked on our door. He had six Serbs with him from Obrenovac. He said we were to go with him. “There were eight people in my house: my mother, Djulka, my sisters, Dzehva and Aida and their children, Elma who was four, Ensar who was two, Sada who was five, and Selmir who was seven. “After about 100 metres we went into another house on Bratislav Street. We were told to go in by the balcony. When we got to the balcony door, I saw that there was a wardrobe against the front door and all the windows had been blocked with furniture. “There were Serbs all around the house and they were drinking. We tried to stay on the balcony but they started to throw stones at us to make us go inside, then they threw hand grenades. We went inside and it was full of people. They were crying. “We were the last ones in and then the Serbs took a garage door from another house and put it up against the balcony, so we couldn’t get out. It was just after eight, when the curfew starts in Visegrad, and we were all in a sort of kitchen-dining room. I saw about 10 babies and some old people, but it was mostly families. “I think there were about 70 people in that room. They weren’t screaming or banging on the doors, just crying because they knew what was going to happen. “I said to my mother, ‘Don’t worry, they won’t kill us’. Then they set the house on fire and everyone inside was screaming, but nobody could get out. I saw the window in the garage door and I pulled myself through it. “I was the only one who got out. I was wearing trousers, a jumper and a cardigan, and I pulled off my burning clothes. Outside the Chetniks were standing around watching the house burning. They were drunk and playing music very, very loud, so no one could hear the sound of the burning people screaming inside. “One of the Chetniks saw me and shouted at me to stop, but they were far away from the house because of the big blaze. Then he just shrugged his shoulders and I ran and hid. I was the only one that survived. “At one in the morning, I knocked on Ismeta Kurspahic’s door with my foot, and then I went to the Chetnik’s headquarters and I said to the commander: ‘Kill me, just kill me.’ But he said he wouldn’t and he brought Dr Vasiljevic to me and then took me to an old woman’s house. Here is the mountain village of Medjedja, in a place the Muslims call the Valley of Freedom. It is a stretch of beautiful Bosnian countryside along the rivers Praca and Drina that wind their way below pine forests and through villages. A 50-mile stretch of the valley that is a last sanctuary for people like Zehra Turjacanin. Thousands of Muslims have fled here, driven out from towns like Visegrad, Foca and Rogatica, to find peace in this valley. But once inside they are trapped – surrounded by the Serbs. “A bird cannot pass from here,” said one refugee. But last Friday afternoon, in the driving thunderstorm, the Serbian checkpoint that guards the western entry to the valley was unmanned. There is no petrol in the valley, so the mountain road along the Praca river is deserted. The Serbs had been through here in April and May. Burnt-out Muslim homes bear testimony to their coming. The people fled into the mountains while their homes were being looted and then moved back to their burnt-out villages, and the Serbs moved on to richer pastures. A Bosnian soldier came up from the river bank to say we were in Free Bosnia. “Come to the commander,” he said. But the commander came along the river path to us. He and his men melting out of the trees, dressed in teeshirts, jeans and running shoes and carrying rifles. They were young, most in their early twenties and wearing green headbands. They wanted cigarettes; none had come through to their isolated valley for four months. This Robin Hood band were going “up” – up in to the hills behind Gorazde to attack Serbian artillery positions. The scout who led the way carried a sack on his back, and the noses of a dozen rockets peeped from behind his right shoulder. The commander, who had a walkie-talkie, was a electrical engineer before he went to war. He wore a green chiffon headscarf with silver spangles around his head. He paused to write our note of passage into his valley. In the village of Ustipraca, Nehad Devlic said the Serbs had come in April. Then he was a rich man, owned three restaurants and two cars and a lorry. He fled into the forest and when he came out the Serbs had taken his Alfa-Romeo, his Volkswagen Golf and his lorry and burned down his three roadside cafes. He now lives from the land, on eggs, wild plums and sacks of wheat that come down from the fields high in the mountain. 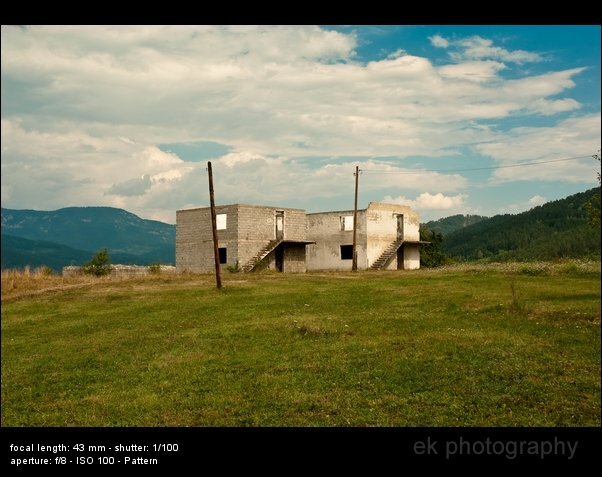 We go to visit the ruin of his roadside restaurant, built in the days when tourists passed on the road to Sarajevo and Dubrovnik. But now the roads have been blocked. They defend the valley by causing landslides from the hill on to the road to prevent the Serbs from coming back up along the river. The balconies of the modern apartment blocks in Ustipraca are filled with chopped wood. There are no cars, no electricity, and the telephones have been cut off. There is a tranquillity in Ustipraca, peace among the charred houses in the shade of the mosque, which has a single shell hole left by passing Serbs making their point as they went through. Old men sit in the sun, surrounded by scrawny dogs looking for food and love, with hunting rifles ready for the Serbs if they come back. In the village of Kopaci it is not so quiet. In Mehmed Mehovic’s back garden, under trees heavy with apples and plums, broken branches cover an 8ft long cluster bomb, designed to open in the air as it falls and send baby bombs scattering over his village. The cluster bomb did not explode and has been embedded in his back garden since June. The sound of mortars boom outside. The Serbs are still mortaring the village from the distant hills. “It’s okay, they are only 105mm; they could be 155mm, they’ve used them before – takes the house away,” says the commander. Every day someone is injured or killed in Kopaci, but they have to hang on. There is nowhere to run to. “Wait and listen for the whistle of the mortar, then you know it’s close” says Mehmed. On Saturday afternoon Senad Niakonja, aged 10, was wheeled in his father’s barrow to see the doctor on the hill, to take out the mortar shrapnel in his back. Among the refugees in Kopaci is Aldijana Hasecic, who tells us of Zehra Turjacanin’s ordeal. He will take us to see her, but first he wants to say that he has come from the woods near Visegrad and has seen the camp where Serbian men are taking Muslim women. On the hill above the village of Medjedja the next day, a weeping woman in an orange polka-dot scarf says: “They took my daughter. They took all the girls from the village. We don’t know where they are. I haven’t seen her for four months”. Standing with her in the ruins of her house, where the only identifiable object is a scorched fridge freezer, are Hamed Sulejman and his wife, Kahriman. They have come to live in the woman’s woodshed. Kahriman says they were burnt out of their village and now her home is the woodshed where she lays out her jars of pickled fruit on a shelf above the mattress. All along the mountain top are small burnt-out villages, clumps of houses where the people who have come out from the forests to live again among the ruins tell the same story, of how the Serbs came, looted their homes, burned them down and moved on. We came out through the trees and walked the last couple of miles into Visegrad, in the open along the road. At first no one seemed to notice two strangers in a town that had a population of 20,000 before all Muslims were driven out and into the valley – 10,000 people. But first there is a little time to pass quietly to the main street, where on the corner with Bratislav Street rust coloured earth marks the spot where the first bulldozed mosque stood. Further down the street another mound marks the site of the second mosque. Behind the supermarket on Bratislav Street, looking out on the cemetery, are the tired remains of a burnt-out house. A house that may have been the one where Zehra Turjacanin’s family and 60 others were burnt to death. We asked casually about a man called Milan Lukic. Papers checked. The English journalists are allowed to pass out of town in a police car with a kind Serb driver who offers cigarettes. A truck piled with furniture is parked outside the burnt-out shell of a two-storey house. “Muslimanis,” he says, and drives us on through another 20 miles of charred Muslim homes and villages, through an apocalyptic rural wasteland that is the new Serbian republic of Bosnia. Biljana Plavsic to be freed! A former citizen of Sarajevo. Professor of Biology at the University of Sarajevo, Biljana Plavsic, rose up the Serb political ladder quiet fast. During the Bosnian Genocide she took part in the dehumanization of Bosniaks. After making a deal with the prosecution, she pleaded guilty to one count in the indictment: crimes against humanity. Genocide charges were dropped due to the guilty plea. *Note: Read this interesting article at Daniel’s Srebrenica Genocide Blog. Bosnian Serb MP’s turn down Holocaust&Srebrenica rememberence days. Today (13.05) the B&H parliament voted on an initiative to proclaim 21 January as Holocaust Rememberence Day and 11 July as Srebrenica Rememberence Day. Bosnian Serb Members of Parliament from Republika Srpska(Republic of Srpska) voted against this initiative. The initiative was based on a European standard which Yad Vashem clearly shows and the European Parliament Srebrenica Resolution. 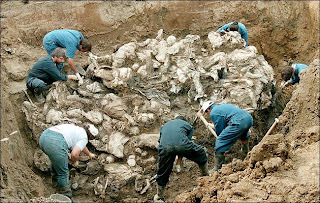 Mass grave filled with Bosniak civilians. Thousands of Bosniaks were murdered by Bosnian Serb Army in a genocide in and around Srebrenica in July 1995.